For the second time in nine days, the Phillies will host a single-admission doubleheader at Citizens Bank Park. After Tuesday’s game against the Atlanta Braves was postponed by rain, the two National League East foes will play two on Wednesday, beginning at 12:05 p.m. The double dip is the beginning of a run that will see the Phillies play 29 games in 29 days. And if that feels like a lot, imagine being the regular position player or pitcher who will be entering the sixth month of 162-game season. If Hoskins homers and no one is there to see it, did it actually happen? The good news is the Phillies have reinforcements coming – at least a handful, probably – within the next week as major league rosters expand on Sept. 1. Odubel Herrera and Aaron Altherr could both be activated on that date (Friday) without having to subtract anyone on the roster. Ditto catcher Andrew Knapp, although he’s a bit further away as he’s just beginning to throw and still getting strength back in a right hand he broke a bone in earlier this month. Mackanin would also like to bring up an arm or three, simply for extra protection. In case you haven’t noticed, it’s been a struggle for Phillies starters this summer: the non-Aaron Nola portion of the rotation has combined for a 5.73 ERA with 37 home runs allowed while averaging five innings per start in 34 games. So you can understand Mackanin’s concern in getting through that aforementioned 29-in-29 stretch, which precedes a day off (just the second on the schedule in September) before the Phillies wrap up the ’17 season with a three-game series at home against the Mets (which has been Home Run Derby often this season). But back to the reinforcements. Mackanin himself volunteered one name on Monday. "There’s a chance (J.P.) Crawford could come up," the manager said, referring to the former first-round pick and top shortstop prospect who has crushed it in the last 2 1/2 months after a dreadful first calendar year at Triple-A. Crawford has to be added to the 40-man roster in November anyway – and will almost certainly be on the big league radar come spring training – so it makes a lot of sense to give him his first taste of the big leagues in September (the Lehigh Valley IronPigs season ends on Labor Day). But where exactly will Crawford play, since Mackanin has said earlier this season that he wanted to honor starting shortstop Freddy Galvis’s goal off starting in all 162 games this season? And if both Herrera and Altherr are due back from the disabled list, how will they get into the lineup with Nick Williams, Rhys Hoskins, and Tommy Joseph? Of their regular outfielders (we’re not including Hoskins, since he projects as the 2018 Opening Day first baseman), Herrera is the only one who is proven after almost three full seasons of productivity. Since the Phillies know what they have in Herrera, and because he’s coming off a hamstring injury, it wouldn’t be the worst idea to sit him for a game or two a week to continue to evaluate the younger, less proven outfielders. "We know Herrera is going to be our center fielder,” Mackanin said. “It’s not of the utmost importance to see (him and Altherr) play, but I’d like them to finish the season and get some playing time." Altherr, though, could just as easily get reps in center field and it’s more important to let him finish a breakout season strong than getting Herrera everyday reps. The 26-year-old Altherr is slashing .285/.357/.536 with 16 home runs this season, but still has yet to play a full season. The current 87 games he’s played in 2017 is a career high. Nick Williams obviously needs regular reps, too. He made his big league debut exactly two months ago from Wednesday and the results have been more than encouraging: .286/.348/.497 with eight home runs, triple triples, and 10 doubles in 51 games/210 plate appearances. And obviously, Hoskins will continue to play every day, somewhere, whether it’s first base or left field. The best guess here is that Joseph and Herrera will get the fewest at-bats out of the quintet of Herrera-Joseph-Hoskins-Williams-Altherr simply because the Phillies have a better idea of what they have already in them entering the final month of the season. I think about [our impending decision at SS] every day, every night. So I don’t have the answer right now. I’ll figure something out. "I mean the longer you see guys play, at some point you have to make a decision and I think we’re closer to making decisions – that’s the best answer I can give you,” Mackanin said Tuesday on whether the season has been a productive one in seeing who fits and who does not moving forward. “We all have different opinions, myself, the coaching staff, (general manager) Matt (Klentak), the people upstairs, we all have different opinions about players. We’re just going to have to get together as a group and make a decision." Although we already probably know the answer to the “Who’s on First?” question, figuring out the infield in the next 9-to-12 months is a bit trickier. 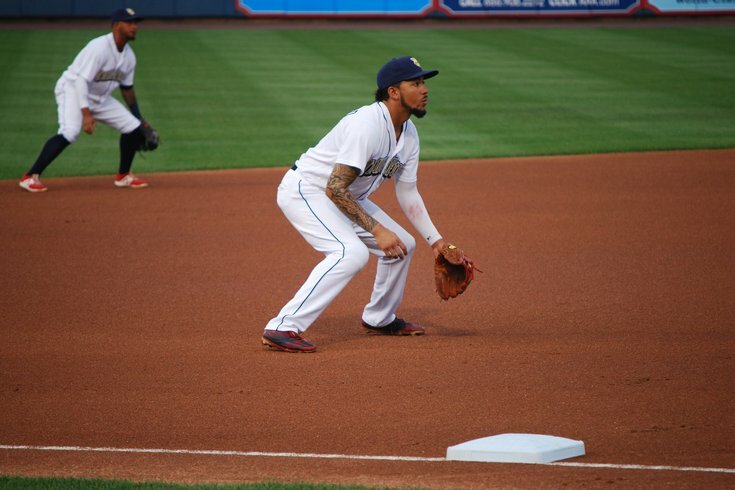 And that brings up back to J.P. Crawford, who hadn’t played anywhere else other than shortstop in his five-year minor league career until last week, when he began making starts at third base (five starts) and second base, too (four starts). Freddy Galvis, a free agent after the 2018 season, is a Gold Glove-caliber defender who has seen his offensive numbers improve across the board, save for home runs (with 11, he’s unlikely to match last year’s total of 20). Perhaps Mackanin doesn't give into Galvis’s goal is starting every game? "I think about it every day, every night," Mackanin said. "So I don’t have the answer right now. I’ll figure something out." People are starting to realize just how good @freddygalvis10 is. Here's what the @FOXSportsBraves crew said last night. The Phillies will obviously need a more certain answer entering Opening Day, with Crawford nearly ready, Galvis and Cesar Hernandez entrenched in the current middle of the infield, and second base prospect Scott Kingery making a push at Triple-A, too. But Mackanin will still need to figure something out within the next week, too, since it would appear Crawford is coming. Could the Phillies give the 22-year-old a few starts a week between the three infield spots, with Maikel Franco, Hernandez, and Galvis getting weekly breathers? Is that the way to introduce a kid to the big leagues, slowing him into play, but also getting a first taste of the majors so he’s not so deer-in-the-headlights in 2018? "Until I know something definite I can’t tell you," Mackanin said of Crawford’s status. "And when I know something definite I’ll go from there. That’s the best I can do. … Matt was supposed to come in today and we’re going to talk, go over some kind of, he’s going to give me his thoughts. We haven't even discussed who’s coming up and who isn’t. "So I’m anxious to talk to him about that. I guess (Lehigh Valley’s) last game is Monday, so I’m sure today or tomorrow we’ll talk about it and I’ll have more to give you then. I don’t want to conjecture on what we’re going to do."